Education is, by far, one of the most important benefits associations offer to members. How this education is delivered, however, continues to evolve as member demographics change. Are associations prepared to meet the needs of young professionals? According to our recently released 2019 State of the Conference Industry Report, the answer is no, not really. Generation Z, the newest generation to enter the workplace, is reported to be the largest generation—larger than Baby Boomers or Millennials. And all indications are that this is a generation who is actively seeking out professional development opportunities and personal connections, making them a prime target for associations. Yet, a mere 7% of associations profiled in the 2019 Report have developed a strategy to address the needs of these current and prospective members. Meanwhile, 50% of respondents have not started the process of developing programs for their youngest members. Creating programs and content tailored to young professionals can be a daunting proposition, particularly for association professionals who are already balancing several different roles and responsibilities. It often helps to see what other organizations are doing, using these ideas to start building and testing small, pilot programs. One such association that has, and continues to develop, strategies to engage younger members is the American Occupational Therapy Association (AOTA). We spoke with Frank Gainer, Director of Conferences, and Melissa Stutzbach, Program Manager of Education and Young Professional Development, who shared their current strategies, and the insights they’ve gained along the way. AOTA’s mission is to represent the interests and concerns of occupational therapy practitioners and students and to improve the quality of occupational therapy services through a wide range of programs and activities delivered to their 60,000 members. Given that nearly half of these members are students, the staff of AOTA wants to ensure they demonstrate the value of membership by helping them transition into a meaningful practice, providing specialized resources and facilitating connections with established professionals and peers. As Gainer describes it, “Our focus on students and new practitioners has been a progressive journey that dates back to at least 2007.” It was at this time that AOTA introduced their National Student Conclave, a two-day event designed to help students successfully transition into a practice. “Our Conclave programs focus on practical skills and topics that are needed for new practitioners to be successful on the job that aren’t necessarily covered as part of a typical college curriculum.” These programs include panel discussions with fellow students who are further along in their clinical training and resume evaluation sessions. The success of this event led AOTA to recognize the need for a dedicated resource to focus on student and new professional development. In 2013, Stutzbach was hired to identify and implement programs designed to increase the success and engagement of young professionals. 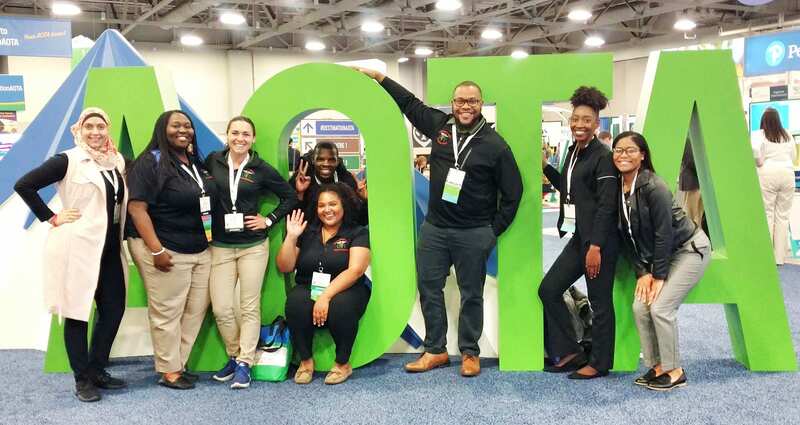 In an effort to start somewhere manageable, AOTA first addressed existing initiatives, looking for ways to make programming more engaging and interactive while providing opportunities to connect students with fellow students. AOTA also introduced a student newsletter written by students to deliver practical information that typically isn’t covered in the classroom. AOTA student members receive full access to their annual conference. But navigating this large event can be overwhelming to students who are also still navigating their careers. AOTA looked to make the event more approachable and valuable to students by including a student session track featuring content that is specific to their experiences. Fun movement breaks: imagine 600 people learning to Salsa for 30 minutes—an element that was so successful it’s making an appearance for the third year! To provide a more gradual increase in dues as a student is just getting established, AOTA offers a new practitioner rate that applies for the first two years after graduation. AOTA has created leadership roles for new graduates on governing bodies, allowing them to provide their input and perspective on the direction of the organization. AOTA also helps facilitate leadership opportunities with state associations. They have also created an Emerging Leaders Development Program—an application-based program where accepted members participate in a 3-day leadership training workshop and are then paired with a mentor who guides them throughout the year on service learning projects. For those organizations who fall within the 50% indicated in our 2019 Conference Industry Report who don’t yet have a plan in place to address the needs of young professionals, Gainer and Stutzbach have the following advice, “Try something small and attainable, gather feedback and build from there.” Both are huge fans of surveying members as well as communicating some of the new initiatives being introduced. Make sure you pull in the perspectives of young professionals across the organization: what’s trending, what they’re interested in and what will resonate. You also need to have at least one dedicated staff member to make sure this input is infused into everything you’re doing or else you’re going to lose sight of it as you become buried with your day-to-day tasks. If you can, get a social media person and figure out how people in that profession connect with each other. Then, add social media components that allow members to feel connected not just to your organization, but to your people. Let them in on the behind-the-scenes of what you do. People have to be empowered to take risks. But create opportunities to take risks that have minimal consequences, so that if something doesn’t work, it’s not a huge monetary loss. It doesn’t have to be complicated. Start small and build from there. Some things will just happen organically that way, so not all the work has to solely be on you. Don’t be afraid to fail. You’re going to try something, and it may bomb, and that’s okay. And for goodness sake, don’t prevent students from going to sessions at the conference. Seasoned members are open to, and excited about, sharing their experience and wisdom, and helping students transition into the workplace. This could be the best place for your association to start. For more insights on how associations are using their educational content to meet the needs of an increasingly diverse group of members, download our 2019 State of the Conference Industry Report.